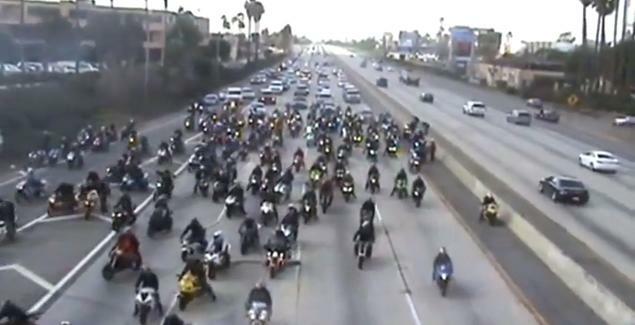 Hundreds of bikers blocked traffic on a major California freeway so that a member of their crew could propose to his girlfriend. But cops are less than thrilled for the happy couple, and now the pair could be facing criminal charges. 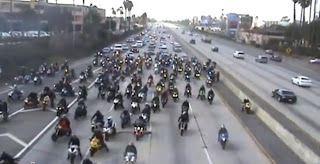 YouTube videos of the stunt showed a pack of hundreds of bikers slowing to a crawl on the I-10 freeway near West Covina, halting traffic in their wake. The groom to-be, identified as Hector Martinez, 24, kicked off the impromptu proposal by spinning his back tire, which was custom crafted to emit a large plume of pink smoke, according to local reports. Martinez then hopped off his bike, doffed his helmet, got on one-knee and popped the question to his girlfriend, Paige Hernandez, also 24. Fellow riders whooped, popped wheelies and did donuts in celebration before the group pulled off. The pair later recounted the story to local radio station Power 106. Martinez said Hernandez had no idea the proposal was coming. 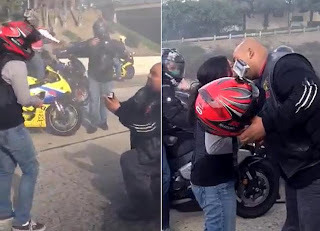 "Only a handful of people knew what was going to happen," said Martinez, who wore a jacket with the insignia of the Subliminal 710 Bikerz during the proposal. Hernandez thought "it was just another Sunday ride," he said. Family members from both sides were watching from an overpass, Hernandez said. The California Highway Patrol said the incident was under investigation, and the district attorney was considering slapping the bikers with felony charges. "It's dangerous when you do something like that," CHP Sgt. Kurt Stormes told The Sun, a local newspaper in San Bernardino. "You've got free-flowing traffic, suddenly traffic comes to a stop and people don't know what happened, and that's when accidents happen." It wasn't clear if the highway halt led to any accidents. Martinez told The Huffington Post the couple planned a two-year engagement to finish school and would like to get married at the Staples Center in Los Angeles. No reports of arrests have been made in connection with this incident, to date.